Brandy Borne and her drama-queen mom, Vivian, take their antiques show on the road, for an off-Broadway farce mixing mirth and murder. 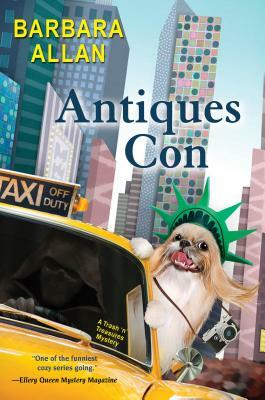 A world away from small-town Serenity, the ditsy duo--chaperoned by their trusty shih tzu, Sushi--arrive in the Big Apple, blissfully unaware that they will soon cross paths with a rotten-to-the-core killer. As the dynamic dames descend upon a comic-book convention--to sell a rare 1940s Superman drawing--Vivian makes a show of keeping the valuable sketch locked to her wrist in a briefcase. When an intruder breaks into their hotel suite, they naturally suspect a felonious fan, over-eager to acquire their artwork. But this not-so-super villain proves less interested in the Man of Steel than in stealing a man's life, as Brandy and Mother stumble onto a murder victim impaled by a pen-shaped award. Suspects ranging from comic-book collectors to crime kingpins lead Brandy and Mother on a merry madcap Manhattan misadventure, taking them from convention hall to strip joint, from retirement home to precinct lock-up. Has the con been conned by a killer? If so, only Brandy, Mother and Sushi can stop this fatally foul funny-book fiend. Don't miss Brandy Borne's tips on antiques! Praise For Barbara Allan's Trash 'N' Treasures Mysteries! Barbara Allan is the joint pseudonym of acclaimed short story writer Barbara Collins (Too Many Tomcats) and New York Times bestselling mystery novelist Max Allan Collins (Road to Perdition). Their previous collaborations have included one son, a short story collection, and eleven novels, including the 2008 winner of the Romantic Times Toby Bromberg Award for Most Humorous Mystery, Antiques Flee Market. They live in Iowa in a house filled with trash and treasures. Learn more about them at www.maxallancollins.com and www.barbaraallan.com.